Xp³D-C is a cost effective additive used to raise the cetane number of distillate fuel stocks and to lower diesel exhaust emissions. Depending upon the fuel composition and the desired cetane number target, our cetane improver is normally used in the range of 0.05% to 0.25% volume. 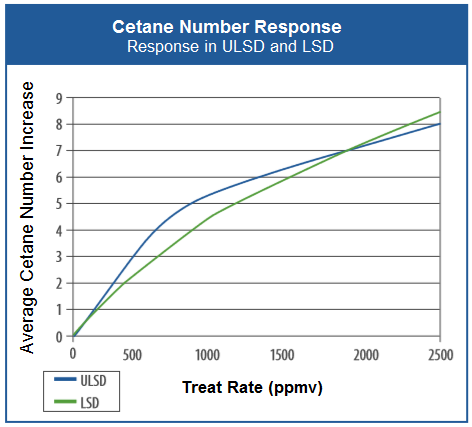 For example, in fuels with a base of cetane 41, you can see an increase from 2 to 6 points dosing from 1:4000 to 1:1000. Weight per Gallon (USA): 8.0 lbs.